PTZ | I Code Raven! So just got done with the end sems, and I decided to get a positional fix from the BTC 3 axis Gimbal using the spare Ardupilot Mega lying in the lab. The final objective, is of course, to track any tagged object autonomously while the drone is in the air. To accomplish this, first I’ll establish a roll, pitch and yaw compensation system, wherein the camera points at the same location irrespective of the angular position of the plane, while it remains in the same position. The next step would be to track a moving object thus, while keeping the position constant, and the final (and most complicated) phase would be to track a moving object while the plane itself is in motion. From what I’ve read, I’m thinking of using dense optical flow for the tracking-while-moving scenario. This would make the system purely reactionary, thus avoiding the need of differential GPS and error prone altitude and distance measurements (for geo fixing). How well suited optical flow is to something like this is something I will be looking into. Things were fun after that, and then we set about trying to figure out how to move the servos on our PTZ camera. And then we got stuck on the math. After much ensuing debate, we shortlisted three very contrasting results. Not such a good thing. Update: (New Year, yay!) 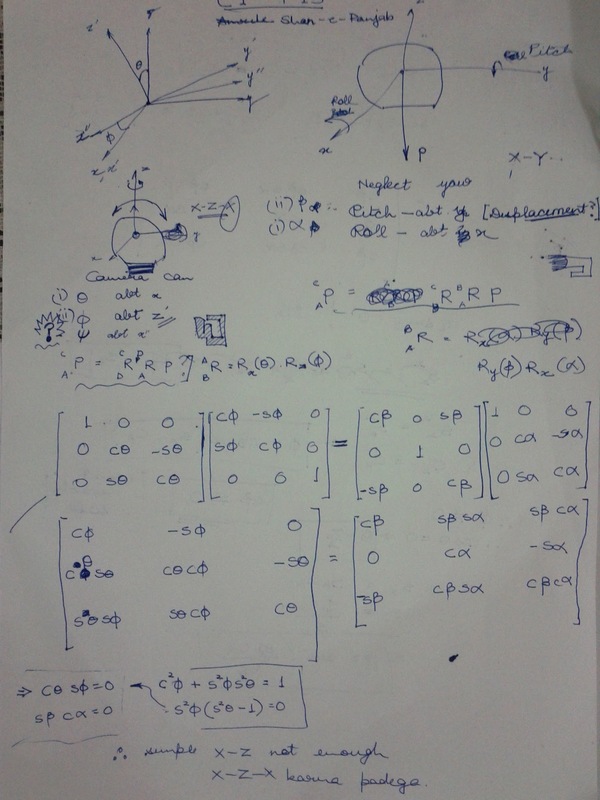 So, figured it out while studying on my Senior project on robotic arms (Have I mentioned it yet? I intend to visually servo a 5+1 DoF arm). It is as simple as equating Euler rotations and Fixed rotations. Now, assuming the camera to be fixed to the plane, the plane will either pitch or roll (It hardly yaws, and we’ll be ignoring that for now). Now to compensate for the motion of this plane, I have to rotate my camera about two *other* orthonormal axes. So, after fixing my frames, I can, say, compensate for pitch easily, as the axis for pitching rotation is the same for the camera. However, for roll, the remaining camera axis is perpendicular to the axis of the plane’s roll. Hence, to get to the final position, one needs to perform two additional rotations about the two camera axes. To summarize, We need to equate an XZX Euler rotation and a XYZ rotation, where rotation about Z is 0. Attached is my (very coarse) paper derivation. So at the top are the two frames. The plane (top-right) can rotate about two axes, one perpendicularly entering the plane of the paper, and the other along the horizontal in the plane of the paper. The camera (below top-left) can rotate about the axis entering the paper, and the vertical in the plane of the paper (which will vary as it is rotated about the previous axis, obviously) So, first I tried to equate an XZ euler rotation, but as is obvious, encountered issues. 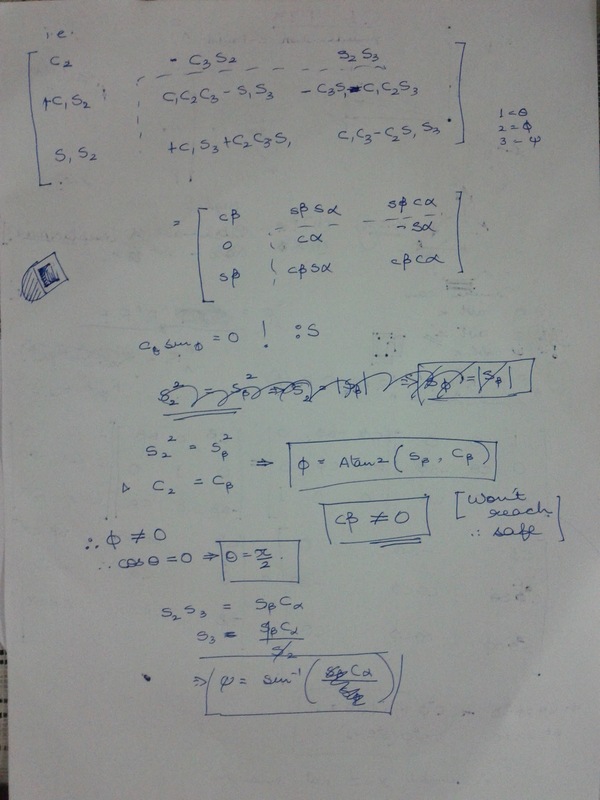 Then changed it to XZX, and the solution follows on the next page. Note, however, that this result is only mathematical. The actual camera assembly has motion constraints. So that needs to be worked out as well. Anyway, shouldn’t be too tough now.